The average person spends 90% of their day indoors, and this amount increases during the winter months. Paints, carpets, furniture, plastics, HVAC systems and cleaners all can contain certain levels of toxicity often in the form of Volatile Organic Chemicals (VOCs) which can in turn increase indoor pollution levels to 5-10x that of outdoors. It has been shown that spending this amount of exposure, whether at work, visiting other businesses, school or home – can have adverse health effects on different individuals including weakened immune systems, illness or increased allergies which in turn affect morale and productivity. Green cleaning processes can in turn reduce these adverse effects. These processes entail far more than just the use of green chemicals, but maintaining a clean and sustainable environment. Regular cleanings using these processes reduce germs, dust and exposure to toxins which are essential steps in reducing indoor air pollution. All-encompassing green services also provide a sense of well-being and purpose for your work environment. Assuring that you janitorial service company (or in house practitioners) are reducing consumption and exposure at every step is key to an effective green clean business. Use of 100% post-consumer-recycled tools and materials is one way to assure this, and purchasing trash, compostable and recyclable receptacles of the same material, like Delamo’s janitorial utility cans and mop buckets as used by Stratus Building Solutions are an effective component to this process. Recycled materials are also scrutinized for quality which also can reduce your risk of exposure new toxins, like plasticizers. This way you are not using new resources for disposal of old, seems contradictory! Reduction of waste continues with the use of bagless Hepa-Filtration vacuums and reusable micro-fiber towels, color-coded to reduce cross contamination and underutilization which in turns saves energy and water for reduced washing necessary. Micro-fibers and Hepa-Vacuums are also more effective in removing dust and microorganisms than typical tools through reduced buildup and their ability to pick up materials down to .1 microns in size, compared to the typical one micron. This means they are able to clean molds, bacteria, smoke and viruses in addition to larger particles pet dander and hair. Lastly, your janitorial service should use certified green chemicals. There are many green-washed chemicals out there claiming to be “natural” or “health-based”, but certifications like Green Seal and EPA’s Safer Choice assure that the chemicals have been put the though testing to assure qualit and efficacy of their claims. 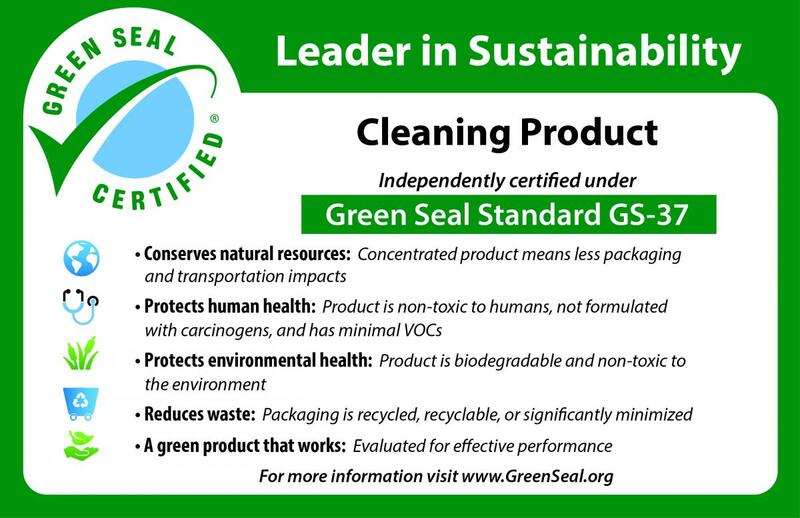 Green Seal offers a GS-37 Certification specifically for Janitorial Service Cleaning Chemicals – so if they make the claim, make sure to ask for the certification to back it! Green Seal Certification also verifies responsible practices and packaging of the chemicals, further reducing your footprint when used. 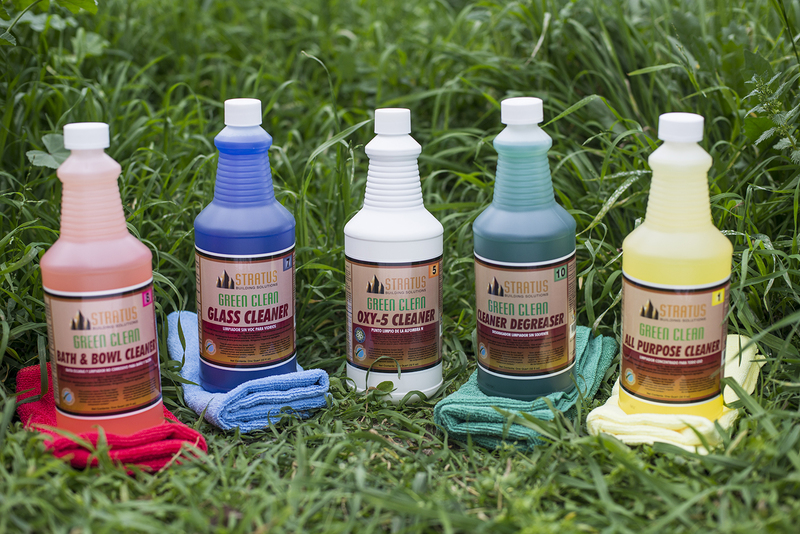 Guaranteeing the health and wellbeing of your customers and employees with the use of green cleaning systems for your business is guaranteeing the robustness of your business. Healthy employees who feel good about what they are doing and cared for are productive employees, and customers who are greeted by clean facilities and leave feeling refreshed are happy customers – and a happy customer is the best advertising available!